Ijen Crater, Mount Bromo, Kumbolo Camping Tour 4 Days is one of the combination trip from Mount Bromo tour package 4 days have combined between popular nature tourism in East Java, Indonesia. This travel package suitable for visitors who have anthusiast in nature expolration. If You are interested to enjoy Ijen Crater, Mount Bromo, Kumbolo Camping package You must choose the flight arrival at Surabaya Airport in the morning and departure time in evening. 09.00 – 10.00 AM, Our driver wil pick you up at Surabaya Airport using Private AC (air conditioned) Car and take you to your lodge around Ijen Crater area for 6 hours driving, Reach your Hotel around Ijen, Stay 1 Night. Get the parking lot in Ijen area, start climb to Ijen Crater rim for 2 hours by relax trekking. 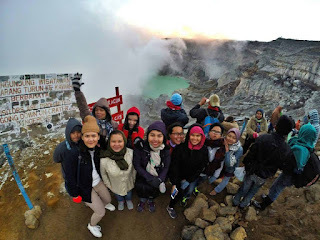 Reach the Ijen Crater top, Enjoy the Ijen Crater view (green acid lake, sulfuric crater, yellowish sulfur and sulfur miners loading the sulfur from bottom Ijen crater) until finish and comeback to paltuding or parking lot for 2 hours. 12.00 PM, Finish enjoy Ijen Crater tour package, Continue to your lodge in Mt Bromo for 6 hours, Reach your Hotel, Stay 1 Night. Reach Pananjakan Peak (highest peak), do trekking for 15 minutes to view point then waiting for Sunrise while enjoy Mount Bromo Milky Way. 08.00 AM, After finish enjoy Mount Bromo tour package, comeback to the jeep then continue to your hotel to have breakfast, take shower, Relax enoughly and preparing to check out. 10.00 AM, Check out from your hotel then start visit Ranu Pane (parking lot in Semeru volcano) by the jeep 4 WD for 2 hours driving. After you get Ranu Pane, accompanied by the porters for your climb (Kumbolo Trekking is similar route with Semeru Volcano Climbing because this lake still in Semeru National Park). Continued to make a permit requirement in registration post, check the climb equiptment, checking your health and then start hiking to the Camping location on kumbolo Lake for 4 or 5 hours climb. After reach the camping location on Kumbolo, Stay 1 night by camping with the porter service. Along night from Kumbolo Camping, You can see the Milky Way or Twinkles that similar with Stargazing at Mount Bromo. Wake you up at 04:30 AM to have breakfast, waiting for Kumbolo sunrise appearance at 05:20 AM, enjoy the Sunrise and view from Kumbolo Lake Camping until satisfied. Around at 08.00 – 09.00, comeback to Ranu Pane (parking lot) while stop for having breakfast, lunch and relax. Reach Ranu Pane (parking lot in Semeru area), continue to your Hotel in Surabaya for 5 hours, Reach your hotel at 06.00 PM, Finish Ijen, Bromo, Kumbolo Camping Tour 4 Days. Before You decide to take Ijen Crater, Mount Bromo, Kumbolo Camping 4 Days, You must prepare Mountain clothes such as Jacket, Sweater, Long Pants, Hat, Gloves, Trekking Pole, Trekking Shoes and other necessaries tools, In order You can adapt with these toursim because these volcanos have 05 - 10 degree centigrade every nights. Make sure, You must choose the departure time at night on the last day in order You have time reach Surabaya, Malang Airport. For detail information about Mount Bromo tour package price and Facilities, You can visit Our contact.